The Twenty Ten theme only comes with one default menu, which is included in the header. However the theme also supports multiple menus, thanks to the use of register_nav_menus(). 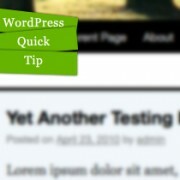 Here’s a quick tip on how to take advantage of this function and add a second menu to the Twenty Ten theme. The next line is where we see the register_nav_menus() being used. As you can see this function accepts an array. This technique can be used in creating other free themes or child themes as well. If you have any questions, feel free to ask in the comment. Yes, you can use WordPress conditional statements and target each individual page, all single posts page, all archive pages etc. I created and added the second menu (mirror’s the top one at the bottom) in the ‘twenty-ten-theme’ but it doesn’t display. Not sure how to make it visible??? Can i use this as a second horizontal line (below primary navigation). I want to make it a submenu for one element of the primary menu. Thanks very much for this – short, sharp and to the point. how do i get back to the function.php to correct this error? also… it is obvious that i am not up to this task… are there themes where i will not have to go into the code? Remember you have curly quotes… make sure you fix those. Russ, you need to access your website hosting using FTP and then finding the functions.php file, downloading it and editing it with a text editor. Yes, that is possible. You are going to have to utilize the is_user_logged_in hook from the WordPress codex. When I use this method to create secondry menus, my menus are duplicating each other. I also want to know how to create pages for secondry menus, I am confused little bit. Can you help me? After following the above steps (editing the functions.php file found in your TwentyTen theme directory (http://yoursite/wp-content/themes/twentyten/functions.php ) you will need to log into your wordpress admin panel and click on Appearance (on the right hand side) and then click on MENUS. You will be able to add a new menu there. Make sure that you give this newly created menu the same name you gave it when you edited the functions.php file. As for pages under this menu… Simply create pages by clicking on Pages in the right hand menu of the admin control panel. Once you’ve added the pages you want, you can go back to Appearance > Menus > and select which pages you wish to add to your menus. You will be able to add pages easily. I think i figured out why the menu bar was completely disappearing. But I’d still like to add the second menu into the child’s function.php instead of changing it through the dashboard’s editor. I created a child theme…a lot of trial and error since I’m new to that too. But could not get the menu right. Something went screwy with the primary navigation and I’m trying to figure out why. I’d created another menu in the menu manager but when I try to use it as the primary navigation, the entire menu bar disappears. I was wondering if it’s because I’d changed the header size. In searching around for an answer, your tutorial seemed the more plausible fix. Great tutorial, thanks. I was wondering how to use this for a child theme. I’m a novice to the functions.php and am not sure how to go about using the unhook filter instructions given by the wordpress codex. Are you trying to create a child theme of your own? or are you trying to modify an existing one? Thank you for concise and to the point explanation. Appreciate the time you put into helping others by posting such helpful information. I’m bummed that twentyten came with only one menu though. They should’ve atleast created two! Thanks Though… looks easy enough. Nice…I like how you move the cursor super slow!! !